The primary flight display (PFD), also known as “artificial horizon”, represents graphically the attitude of the aircraft (roll, pitch and yaw). This display is highly configurable in colours and size. It is possible to select between the 2D and 3D visualization, and also the surface deflection can be represented. WIDGET: user can define the widget opacity, size in pixels (width and height), sky and ground colours. PFD: it can be selected if the compass, indicators and guidance are displayed. Besides the colour of each one of them is also configurable. Surfaces: allows the user to display the different control surfaces with a determined colour. 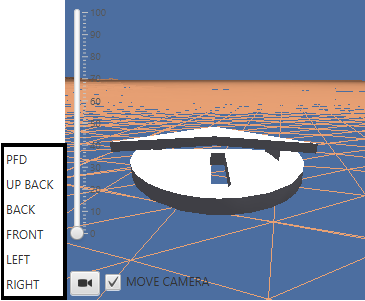 3D: allows the user to modify 3D options. If 3D visualization is enabled, waypoints and external views can be displayed. By clicking the camera icon, the camera view can be selected: PFD (internal view at the cabin), UP BACK, BACK, FRONT, LEFT, RIGHT. When an external view is selected, it will be displayed a slide to change the distance between the camera and the aircraft, and a ‘MOVE CAMERA’ checkbox, which allows to move around the view by dragging the mouse on the widget. 3D model: ‘Manage models’ button displays a configuration panel to introduce the custom aircraft model to be displayed. Open: it permits to select an STL file to be loaded. Save: save user changes in an STL file. Use this model: select the current model to be displayed on the widget. Origin units: user can select origin file units. The model is real-scaled according to the terrain shown on the widget. Axis max: axis length in meters. 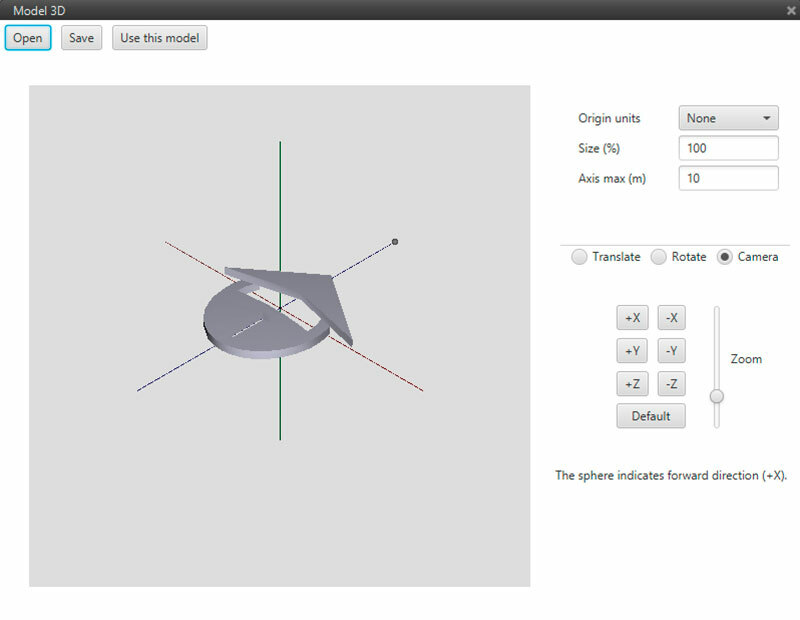 Translate/rotate/camera: translate and rotate modify model orientation. Camera changes the view displayed in Model 3D window. X,Y,Z buttons produce changes according to this axis. Default button resets any modification.